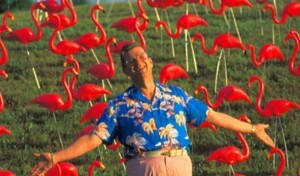 One of the most popular rentals is the plastic pink flamingo, often selected by customers for their high “shock” value. While the plastic pink flamingo might be the queen of kitsch, it was at one time a status symbol to place on the front lawn and created by a classically trained artist, Donald Featherstone. I was originally hoping to interview Donald Featherstone, but unfortunately his health began to deteriorate at the time the interview was being planned. As an alternative, I was connected with a close friend and colleague, Tom Herzing, who wrote a popular coffee table book with Donald Featherstone, Pink Flamingos, Splendor on the Grass. The original Donald Featherstone pink flamingos are worth money today, especially if they have the Donald Featherstone signature on the bottom. You will find the whole story about the creation of the plastic pink flamingo fascinating, including the ups and downs of the pink flamingos popularity. Donald Featherstone from Tuck on Vimeo.